Where The Movie Stars Work! Do you get “Star Struck” when you see movie stars? Boy, I sure do and I don’t even know why. Studio Tours are a great way to get as close as you can get to possibly seeing one! You’ll see a real life behind-the-scenes look at working television and movie facilities in day to day operation. 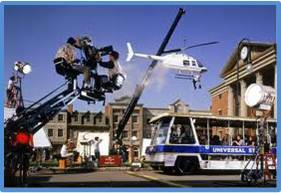 How these tours work: Usually groups of about 12 or so pile into trams or stretched golf carts for an intimate view of the inner workings of TV and Movie Studios. 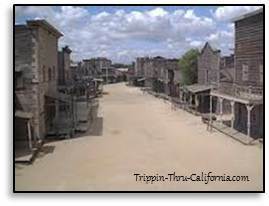 You’ll see sound stages, craft shops, props, costumes, sets and back-lot streets. No two tours are the same. There’s no telling what or who you might encounter because nothing is staged! Who knows, you might get lucky and see one of your favorite movie stars! The best way to see television stars in action is by going to a live taping. Get an All Access Hollywood Studio Pass for one price! (includes 4 Studio passes in one.) This sure can save you a lot of money and the great thing about it is you can take up to 30 days to use it! What to wear: I recommend wearing good walking shoes and if you are going to a live taping inside a studio, you’ll want to bring a sweater or something to cover up. They crank the air up because the lights on stage are so hot so it gets chilly sitting there.